All being well, I should be at the Warrington show (Saturday) as it's only just down the road from me. not sure which day yet, but traffic won't be any better either day. 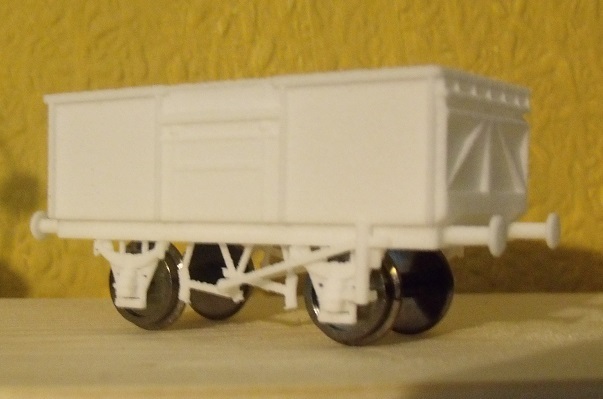 latest batch of 3D printed items(including the wagon) are on the way here. Made the wagon available . I found it was pushed round test layout for a while, so runs OK,but will add weight before running it properly. It was nice to see you last Saturday and have a chat. Sorry it's taken until now to reply but had to load up a new isp (Chrome!) and of course, had to resurrect all my passwords. Anyway, I'm impressed with the wagon, it looks pretty good to me. Must do some selling so I can buy a few. just a quick update on my own progrss. Am currently building the Oerlikon 3 car EMU,and have done design for a GEC unit(including the extra coach). I am considerung starting on a SR EMU, probably a WIM, as the shape of the roof, being converted from ex overhead supplied units, makes them a bit different. EMUs are a good model for HO, as less problems with chassis. I hve used an ENDO power bogie, and they are definitely better than Tenshodo. Only problem is that they are too short, but I can live with that. 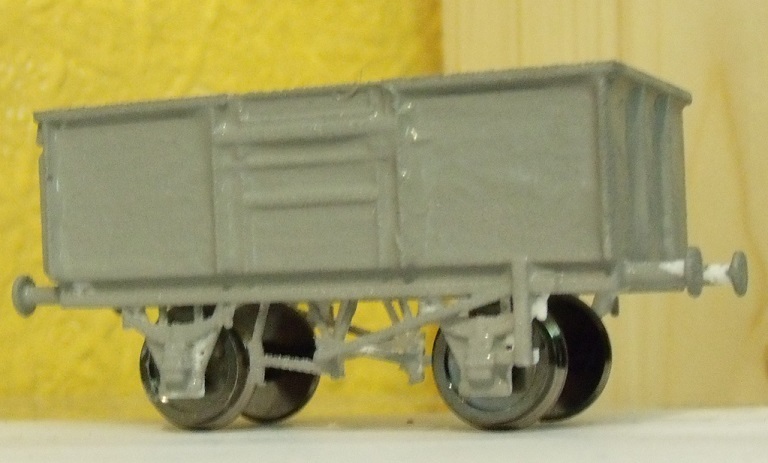 Other bogies come from Playcraft Mk1 coaches. Once I have another EMU, almost certanly the WIM, I will start on layout. My idea is for a west London location, possibly an upgraded Hammersmith&Chiswick branch line terminus. I would assume new art deco station buildings were built, and the station links to both North London/Watford service and Southern one. Time period probably late 50s early 60s. Looking at the station layout, there was room for double track, so it could have been developed. looking at scale drawings, and I mudded the 2WIM with the 2SL. As it is the 2SL which has the lowere front roof section, it is those which I will do. Both were converte from LBSCR stock, so in theory probably could do both . Given thediffernt route I am planning, there may be a different name, but I won't think too much about that. I have been working on a Brish HO boxfile layout, now I stage I can put it to one side. The more I play around with HO the better it looks, and apart from well detailed OO items I have I am concentrating on HO. Followng on from the various EMUs, I have now done(waiting for it to print) an LNWR steam railmotor, and am currently working on a Ford Dagenham diesel electric loco. Although I am also working on a small London themed tram OO layout, I will probably start to look at some London trams in HO. Might then combine that with a dockside/industrial with tram cross, and maybe an upper level for mainline EMUs. Somewhere east of the city of London. And it will havea footprint not much bigger than an APA box, it will need to fit in my suitcase. Before I start on that I must get started on my West London layout. I'm strongly tempted to get rid of all my 4mm stuff and go H0 for everything that I do. I have an eclectic collection of British H0 anyway and a small amount of scratch building will set me up really well. I am pushing on with my 3D printed designs. Easy to work initially in 7mm/ft then half it for 4mm/ft. I also resize to both 4mm/ft and 3mm/ft. The challenge is finding suitable chassis for locos, but i keep finding something that will do. Only by making enough stuff available will it become more popular. I often now tease and put British stuff on my French layout. Getting the message across to magazine editors is more difficult. There seems to be a restence to do something different, unless it is continental, where people seem to be more broad minded. I wonder if contacting marketing departments for model rail companies and telling them they could sell 8 wagons in HO for every 7 wagon in OO. I know it is not that simple, but a lot of people buy enough to fill up space on their layouts. 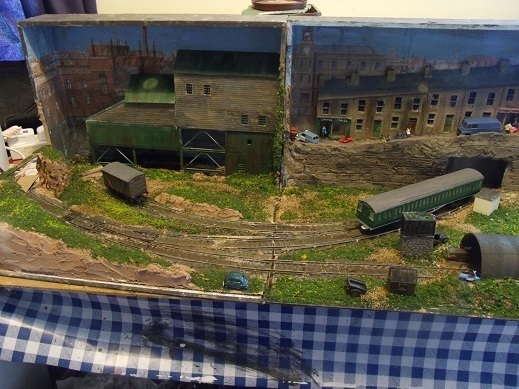 Just wondering if maybe getting some British HO on show at Manchester exhibition might help. Especially as the only r2r model of a Manchester tram was in HO, being a special commission I think. I have just done a design for a L&Y steam railmotor(need to get a test print), and working on some Tyneside electics, starting with the LNER articulated ones. Well, I finally took the plunge and ordered one of Simons lovely looking WD Austerity tank bodies from Shapeways, I look forward to building it into a working loco. Thanks for doing all your designs, Simon. I have been attempting to model in British H0 scale for many years now and have slowly (Very slowly!) built up a very varied collection of models. It is hard to put together a collection that 'fits together' but with perseverance, it can be done. I'm nearly at the point where I can model either a modern quayside, an LMS/GWR branch or an SR branch, it's just a case of getting myself focussed now. 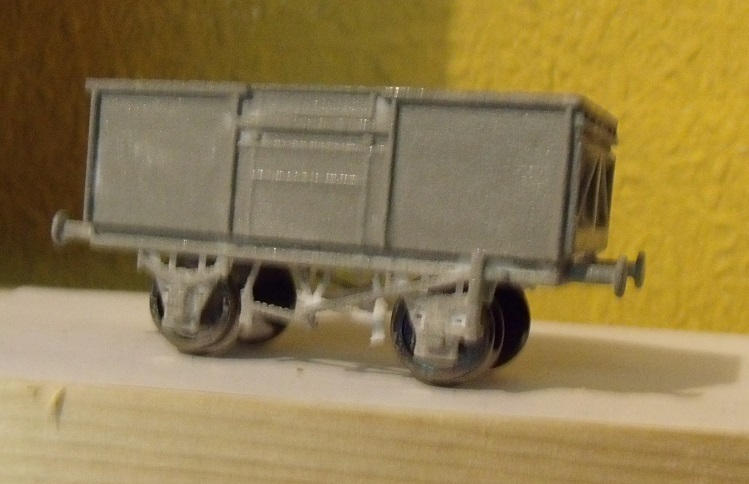 Thanks, not the easiest model, but it just about fits one of the newer versions of Bachmann 03 diesel shunter. I like HO, but finding r2r chassis to fit is not easy. The reasons why British modellers went OO is still relevant, but I am sure some of the newer chassis coming out will help. The new Bachmann J72 is thought to be very useful for HO, assuming Bachmann don't decide to put motor in some daft place. In effect DCC has helped as it has meant the manufacturers can't just fill every available space with lead weight. Of the older chassis the Dapol/hornby Terrier is useful. Again as it is a small loco in OO, the motor is nice and low for HO. For a good running diesel, I recommend my model of the Ford Dagenham loco, as it fits onto the Bachmann GE70(?) chassis. It shows that the Ford loco was in effect a British load gauge version of the American diesels of the period. For brick building I recommend the Auhagen kits as they do a good Flemish bond. The Factory Gates(building) kit has a lot of walls so could cover a lot of space. I think my travels abroad have opened my mind considerably, when I was young, I never even realised that '00' was wrong, it's only when you see the real thing and compare with the model you start to see it. Once you see it, there is no going back! I'm strongly tempted to get rid of all my 4mm stuff and go H0 for everything that I do. This is now an ongoing if slow process. Thank heavens for eBay! On checking Auhagen kit have, I notice it is English bond. Quite unusual for a continental building, as I would have expected it to be Flemish bond. At least it is still better than most OO scale buildings using incorrect stretcher bond. Like having your eyes open when you first realise OO is wrong gauge for scale, once I started to realise brick bond was wrong on most models I could not stop noticing it. Luckily most new model kits are coming out correctly, or at least not as wrong as they used to be. One thing with HO, again with bricks, don't be tempted to use OOo scale ones, they look too big. I have seen it on some French models, where 3 rows are used instead of 4. A pity when everything else looks so good. If in doubt best to stick with stonework.